I have been with GCI working as Introducing broker refer lot of account some made profit and some loss, few one closed their account and get the money back with well way even single penny. Withdrawals are so easy one-day processing, never ever any problem in getting back money, getting my commission every month regularly with any problem. What a class broker in the forex Industry. Come with me open account and get trading way in style. If you know how to trade, you will not have any issues Moreover, customer service has been pretty good. thumbs up. I have been trading with GCI for over a year throughout their ICTS Live Account. No problems at all. I must admit that, their trading platform is user-friendly. Trading instruments are not as much of as some other regular brokers I have seen. However, it is not a matter for me as they offer all major forex pairs and crosses along with major stock PMs, indices, and oil. That is more than sufficient for me. No questions about deposits and withdrawals process. Even, customer service has been quite good. I tried a few forex brokers until one of my friends invited me with GCI. Their trading platforms are flexible enough and welcome bonuses are frequently interesting (wait for them to have a special offer; they do it regularly every other month). Customer service has been ok; opening the account was trouble-free and completed in a matter of minutes. To the unusual of my experiences, withdrawals have been proceeded successful timely. GCItrading is founded in 2002 and is one of the leading online trading broker which provide to their clients comfortable conditions to trade Forex, Gold, Crude Oil, Shares, Indices and other. The company is regulated by IFSC, They offer to their customers fast executions of the orders under 1 second, 100% of limit orders, 0% slippage on all stop and entry stop orders. They won a lot of awards such as “MOST INNOVATIVE FOREX BROKER EUROPE 2013” by INTERNATIONAL FINANCE, “BEST FOREX BROKER EUROPE 2013” by FOREXEXPO.COM, “BEST FOREX BROKER” by FOREX-RATINGS.COM and other. When you open your account, you will receive free forex training, education materials, free forex ebooks, free trading signals, video trading tutorials, information about metatrader4, free demo trading account, expert advisors, high security of your payments and security of your account. They have first class customer support, you can ask them for anything. The maximum leverage that you can use is 1:400, but we recommend to use low leverage and low margin. You can trade a lot of trading instruments with them, you can trade with your mobile, so you can stay connect to your trading account constantly! 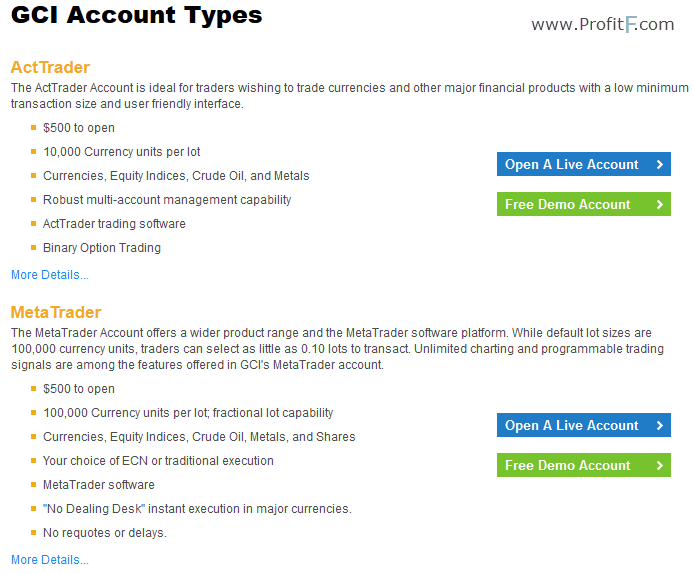 They offer two account types with different trading conditions. They have promotions to their clients known as affiliates programs, so you can get extra cash for your referrals. There is no limit to refer a friends and the bonuses depends on account size deposit of your referrals. They also offer 10% bonus on any deposit, so if you deposit $1000, you will receive up to $100 to your trading account! Get your additional bonus now! Start trading with GCItrading and make profit!